Choose from our Original Decal or our NEW Factory Decal Kit. 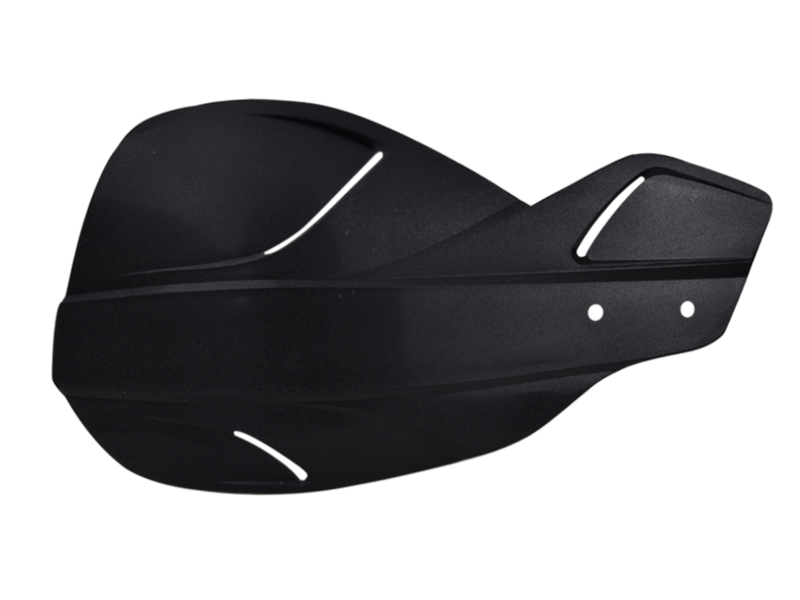 THE GOOD: These offer good coverage when mounted onto full-wrap aluminum handguards and look really cool on the bike. THE NOT SO GOOD: The stickers that make them look so cool are very thin with weak adhesive. SUGGESTED IMPROVEMENTS TO MAKE THIS A 5-STAR PRODUCT: Beef up the sticker’s thickness and adhesive. Also, don’t drill the mounting holes completely through. Perhaps, on the inside of these shields, mold-in some dimples to accomodate the Primus mount and then include a couple of more evenly-spaced dimples for mounting to full-wrap hand guards. Agree on the stickers but look great and work like they should. All around great shields, i don’t have a problem with them breaking if you hit the ground in below freezing temps. i would recommend them for everyone! Worth every penny. Great price. Great product. Will use these on all bikes that I have. Thank You G2 !! Bought these in conjunction with the competition hand-guards. They look to be substantial and I think they will protect my delicate fingers in the event of a violent attack of branches. As an earlier reviewer mentioned the stickers look to be poor quality, the adhesive is visible and almost looks like the graphic is floating between it and the outer clear-coat. A proverbial non-issue in my opinion though and I think they look great with the competition guards. For reference, i got the black competition guards and the white/grey shields. Very satisfied with not only my purchase but also with my dealings with G2. They appear to be a local/family owned business and were very pleasant to buy from. Will buy from them again in the future. Great product. Love the style and protection these shields offer. we love this product and all of the different combinations you can have with it. Over the years we have tried several brands of shields. The set the G2 sells are strong and fit and finish is top notch. Each set comes with new hardware and the correct size drill bit. When installed we add a little grease to the self tapping screw in the event you have to remove them there will be less risk of rounding the head off or breaking the head off. Very durable and clean look. These are good looking hand guards that fit well and protect. I chose the white with the “original” sticker/decal for my Xtrainer, looks great. Customer service when I had a small issue was solved immediately. Will do business again. Thanks. Blocks a lot of roost. Very solid, they stand up to my abuse on the professional GNCC circuit! These hold up well. Sure the stickers ding up/scratch but what do you expect! Really good handshields. They look and fit great on the full wrap style handguards and the graphics come installed on the shields. These in my opinion look the best of all the guards out there and are very easy to install. Works well. Rigid enough to protect, pliable enough not to break or crack easily. Would have gave them 5 Stars but they were missing “mounting hardware” which were identified as self tapping screws. Since I had to drill the holes anyway, I just went ahead and tapped them and added my own bolts/loctite. Very sorry about our mistake. Please call Cody (815-778-0468) for your next order and we’ll give you 20% off to make up for this inconvenience! nice change from the basic ones of years past. Smacked a few trees and they are holding up great. These handshields look awesome on my bike and are super strong. They don’t break as easily as other brands I have tried. This the second set my son will be putting on his bike. They look great and we are very satisfied with the product. Will be buying more as needed. Thanks!! !